AeyTimes Creativity Quiz – How Creative Are You? 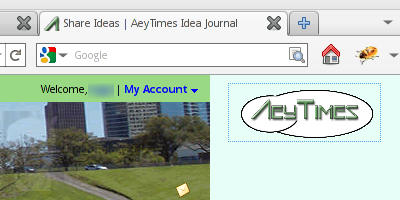 We’re pleased to announce the completion of the AeyTimes button, which you can put on your own website. Now, your visitors can easily share enlightening pages from your website to AeyTimes. We are proud to announce the release of the AeyTimes Android app. This app lets you view and share ideas on the go straight from your mobile device. Get your AeyTimes Android app here, or with this QR code. We hope you enjoy using these pieces of software to improve your life! Setting AeyTimes Idea Journal to be your home page can be an easy way to keep yourself inspired with various creative ideas on AeyTimes, and to allow you to easily contribute and share new ideas yourself. Here’s how you can make AeyTimes your homepage, easily in Firefox. First, visit http://aeytimes.com . Once there, click and drag our AeyTimes logo near the top left part of the page. Then, find your homepage icon in your browser. Continue dragging the logo and drop it on top of the homepage icon. Drag and drop onto your home icon in your browser. 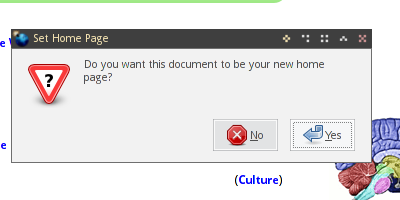 When prompted, click “Yes” to make AeyTimes your homepage. Your homepage should now be set to AeyTimes! We are pleased to announce that we were able to fix a major bug that prevented people from submitting ideas in foreign languages such as a Chinese or French. This fix should more easily allow people to submit in many different foreign languages. We are also pleased to announce the integration of a Google translation widget on AeyTimes, allowing a page to be easily translated to many major languages so that more people can easily read in their preferred language. We hope you will find these improvements helpful to your sharing ideas and reading ideas on the AeyTimes Idea Journal. Hope you all had a great start to 2011! We’re delighted that since our last newsletter during the fall we have had more people join AeyTimes, as well as share their experiences, expertise, and ideas with us. Keep up the good ideas! (2) The AeyTimes Product Feedback Widget ( http://wordpress.org/extend/plugins/aeytimes-product-or-service-feedback/ ). With these two new widgets, you can now include them on your site to remind your website visitors or customers to provide you with valuable ideas and feedback, helping you to provide a better service or experience for them. You may have also noticed that we have recently made some layout changes on AeyTimes to improve site aesthetics, the page layout, and site navigation, as well as to help you find what you are looking for more easily. We also hope that including related (if their script is working properly) books or other items from Amazon will help you expand your horizons on the particular idea shown. Finally, you may have noticed that a new and exciting feature introduced into the idea pages (eg JOYs ) is our “Enlightening” feature, which allows users to easily and quickly note that they appreciate an idea by clicking on that link when logged into their account. (b) displaying ideas that you like by clicking on “Display This Idea” on each idea page ( eg Reading Books Faster ), and then inserting the code into your site. You may also wish to subscribe to newly-featured ideas on AeyTimes either through an RSS reader ( http://feeds.feedburner.com/AeytimesShareIdeas ) or as an email subscription ( http://feedburner.google.com/fb/a/mailverify?uri=AeytimesShareIdeas&loc=en_US ) to keep up-to-date with other people’s interesting ideas. Wishing you a very happy, prosperous, and enjoyable time in the coming year! Join AeyTimes to receive the AeyTimes Newsletter directly in your inbox! 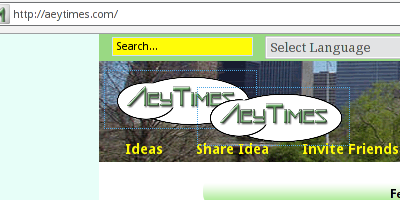 (1) We now have an AeyTimes Ideas Widget ( http://wordpress.org/extend/plugins/aeytimes-ideas-widget/ ), where you can place your latest AeyTimes ideas as a sidebar on your WordPress website for your visitors. You can customize the title of the toolbar, as well as the number of ideas you wish to display. (2) We now have a Chrome search bar ( https://chrome.google.com/extensions/detail/ohhbbodkfbcabocjfiajlininjpibopp?hl=en-us ), and a Firefox toolbar ( https://addons.mozilla.org/en-US/firefox/addon/181066/ ) for people wishing to access AeyTimes more easily from their browsers. (3) The AeyTimes News site, with the latest interesting or important news from our site has been set up, and is located at: http://news.aeytimes.com/ . We also have a brief FAQ page, which helps to answer a few frequently-answered questions at: http://aeytimes.com/index.php?view=info_faq . These two pages can also be accessed through the footer of the site. (4) Over the last few months, we’ve also fixed a large number bugs in the site, improved the idea submission process (including an improved text editor), improved subscription and social bookmarking options, and streamlined the site design and navigation structure to better help you navigate through the site. (5) Also feel free to join us on twitter ( http://twitter.com/aeytimes ), or to subscribe to our RSS feeds ( http://aeytimes.com/media_feeds/featured.xml ) or email feeds ( http://feedburner.google.com/fb/a/mailverify?uri=AeytimesShareIdeas&loc=en_US ). We’re extremely glad some of you have already taken an opportunity to share ideas on AeyTimes. We hope others will also share their ideas on AeyTimes, as it can be quite fun. We are proud to announce the release of our own WordPress widget. After installing the plugin, you can share on your blog your latest ideas that you have submitted to the AeyTimes Social Network. Just enter your username and your ideas will appear on the sidebar (see right). Get your ideas widget here. Frequently-asked questions for the ideas widget can be found at the ideas widget FAQ. Welcome to AeyTimes News! We will post news, updates, and other information relevant to AeyTimes here. What is an Idea ? Predict the Future Game: What Will Be Invented in the 21st Century? Some more AJAX would liven up the site.